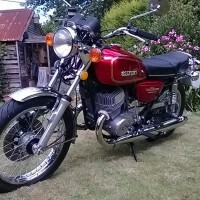 This GT750 was rescued from a barn and restored by its owner. The engine was stripped and the crank was rebuilt with new seals. 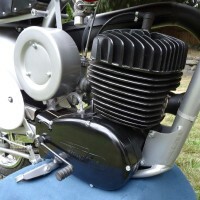 The alternator and points covers were replaced with NOS items as were the water hoses, SRIS tubes and the brass connectors. The water pump was replaced. 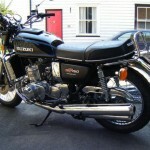 The engine cases were polished and the correct ‘Liquid Cooled’ decals were applied. The 11 large head bolts were replaced. This bike has the rare optional thermostatic fan kit fitted. The radiator and its silver cover were repainted. The carburettors were overhauled, all of the the jets were replaced with genuine Mikuni stock jets, including the pilot air reduction jets. 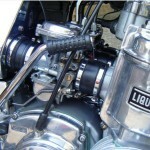 The linkages and brackets were chromed or zinc’d and the bodies and tops were polished. 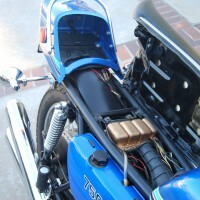 The airbox was powder coated, the air filter replaced and the chrome covers replaced with NOS ones. The fuel tap was rebuilt with new seals and polished. 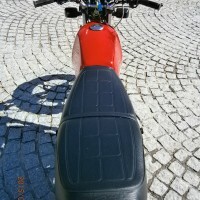 The fuel tank was professionally refinished in black. 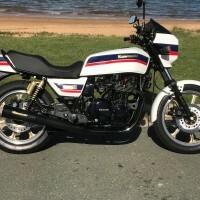 The tank and side panel badges were replaced the correct type NOS items. New decals and stickers were applied where they should be. NOS headlamp ears were used and the headlamp was repainted. 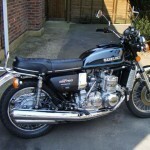 The rear lamp and carrier were re-chromed as was the radiator crash bar. The correct brown-faced clocks were restored. 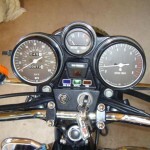 The clock covers were re-chromed and a new light console and Suzuki badge was fitted. The steering head bearings and swing arm bushes were replaced. The wheels were rebuilt with new rims, spokes and bearings. The chain adjusters, wheel axles and brake arm were chromed. All of the alloy on the motor and forks was highly polished. The bike was completely rewired with NOS looms front and rear. The master cylinder and both brake calipers were refinished and a NOS reservoir cap, seals, pistons and pads were fitted. 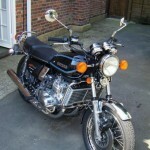 A lovely restored Suzuki GT750B Motorcycle.